This post is part of the WordPress Weekend Projects series. In this series, you will find bite-size tips to enhance, secure, or optimize your website. Each tip should take an hour or less, and can be done without interrupting your precious weekend time too much. 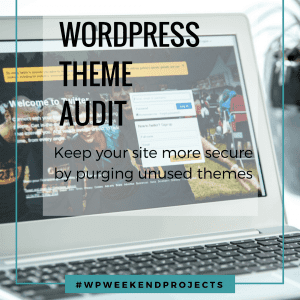 See all of the WordPress Weekend Projects posts at https://beyondtheoffice.com/blog/wordpress-weekend-projects. You should always keep one of the twenty-something themes on your site. By this, I mean one of the default themes that comes installed with WordPress like Twenty Seventeen, Twenty Sixteen, or any of the other ones, back to Twentyten. It’s a good idea to keep one of these default themes in case it’s needed for troubleshooting website conflicts and other issues. If you are using a Child Theme, then you need to keep the Parent Theme installed on the site, as well. Only the Child Theme can be active, but it relies on files from the Parent Theme to work properly. When I say to get rid of them, I mean deleting them from your site. As with unused/deactivated plugins, if the files are still on your server, then any relevant security risks could still affect you. (If you read last week’s post, this may sound familiar.) Before making any changes to your site, I always recommend making a backup of your site. There’s several backup methods listed in this post if you’re not familiar with how to do that. Make a complete backup is a good idea in case you accidentally get rid of a theme (like a parent theme) that you actually do need for your site. Theme audits are a bit easier than a plugin audit. If the theme isn’t active, and isn’t the Parent Theme for your active Child Theme, it can be deleted. If there’s a lot, I usually prefer to delete the folders via FTP or cPanel File Manager, just because it’s faster to bulk delete that way. But, if you’re not familiar with those methods, deleting them from the WordPress Dashboard is fine. When you’re reviewing your site to make sure it’s working properly, make sure you take a look at more than just the home page. Also review any pages with specific functionality, like contact forms, sliders, galleries, membership, events – anything like that. Also take a look at your blog page, just to make sure all is happy there, as well. Cleaning out the extra theme will help to keep your site more secure, and keep your backup sizes smaller. Make a full backup first, just as a precaution. And if you have a web developer or support person who maintains your site on a regular basis, check with them before doing anything. Chances are they’ve got a good handle on this already. If you’re feeling a bit shy about the backup or making changes to your site, get in touch with me and ask about my care and maintenance plans. I want website owners to feel comfortable and confident with their sites – not panicked that something is going to fall apart. Check back next week for the next WordPress weekend project, or subscribe to get them all right in your inbox. Until next time, Cheers! Share the post "Remove unnecessary themes from your WordPress site"